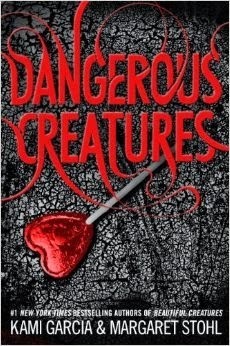 When talking about why they wrote "Dangerous Creatures", Kami Garcia and Margaret Stohl mentioned that the series was like a gift to their loyal fans. A reward for their loyalty and support through all of the "Beautiful Creatures" books and feature film. Since fans were always curious to know more about Siren, Ridley Duchennes, and her hybrid Incubus boyfriend, Wesley "Link" Lincoln, they decided to write a new series from their point of view. After tricking his mama into thinking he was off to a good Christian college, Link and Ridley hit the road for New York City. (After they establish that they are dating again, that is.) While Link thinks he's off to make it big with his music, Ridley tries not to give away the real reason she's along for the ride. After a not so warm welcome to the City, Ridley's carefully kept secret starts to unravel... and even she has no idea that the danger she and Link are in is much bigger than the little lies she's made. DC also gives readers a glimpse into Ridley's past. We get to see scenes from her childhood (which include Lena) that help readers understand why Ridley's personality lead her to be claimed by the Dark. NOT to mention that there is potential for a love triangle going on and by the end of it all, and I wasn't rooting for Link! I heard that this new series could be read, understood, and enjoyed by someone who had not read the "Beautiful Creatures" series— and as someone who did not read the BC series, I think that's about half true. It took me until about halfway into the book before I started to feel comfortable and familiar with the terminology of the Caster's World that was created in the BC books. There were many points in the book where I just had to accept a memory, or explanation as something I just didn't get and move on with the hope it would make sense eventually. On top of that, the main plot is based on characters and events that happened in the BC series. Garcia and Stohl did write enough information into the books that I got a super basic understanding of what happened, although the gravity of the situation probably would have hit me harder if I knew the whole story. However, if you have read the BC series, I can see why this book would be a real reward/treat. One of my favorite things about reading a long series is picking up on something that the author mentioned a few books back. I get a little thrill from my immediate understanding of the importance of the tidbit. Like I'm a real insider to that world. I think anyone who loves the BC series would get that thrill within the first few pages of DC and keep it throughout the book. There were a few instances where I thought, "I can tell this is huge... but I don't know why." To someone who gets it...I'm sure those moments are real "Omgosh omgosh OMGOSH!" moments. While this read was a little confusing at times for a BC outsider like me, I did enjoy it and am sure that I'll be right on track with everything that happens in the following books. I think my only real complaint would be that I felt like there were maybe TOO many cliff hangers at the end of the book. (mostly because I'm afraid I'll forget all the little things I wanted to know about between book releases) While I enjoy the anticipation in most cases, I wish there were a few more loose ends wrapped up, and a few other promised stories told before the giant TO BE CONTINUED moment. Drink: In the book, Nectar of the Gods is served in Club Sirene. Since the book only describes it as a golden liquid, I looked up Nectar of the Gods online and found this. So grab some El Melon and take a drink with the Clubbers at Sirene. Also, read my interview with authors Margaret Stohl and Kami Garcia in the Deseret News.